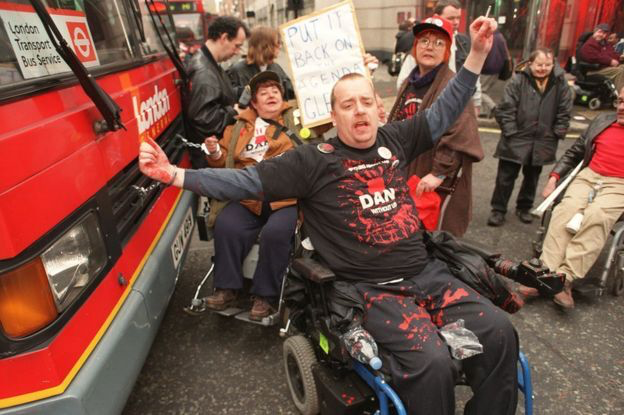 In the 1980s, Angry Brigade-esque disabled activists named Reasonable Adjustment fought a bloody battle against Margaret Thatcher’s right-wing government and an oppressive medical establishment to gain rights. Regarded as terrorists by some and freedom fighters by others, their actions included shooting dead a prominent geneticist who advocated euthanasia in utero for those with conditions such as spina bifida, bombings of inaccessible train stations and the siege of a benefits office. Reasonable Adjustment is an evocation of an armed resistance movement that never happened. This gallery-based visual arts project premieres in January 2020 at The Art House in Wakefield. The exhibition centrepiece is a mockumentary, in the style of BBC One’s current affairs documentary programme Panorama, which has been purportedly produced in 1985, assembled from a melange of recreated incidents, archive footage of real terrorist attacks and disability protests. Artefacts related to the armed struggle are also part of the exhibition – for example, a Kalashnikov rifle with the disability rights slogan “Nothing about us without us” emblazoned across the stock, alongside posters, cartoons, photographs of murals, pamphlets arguing the cause, and outraged right wing press front pages. The exhibition concludes with a display on how a new generation of disabled dissidents are using social media.